In October 1992, nearly 1,000 music fans were arrested at a rave in Milwaukee’s Third Ward, sparking a controversy about electronic dance music and its purported influence on young people. In those days, DJs spun records imported from Europe as crowds in warehouses danced until sunrise, glow sticks raised. After the raid, promotional word about raves spread quietly. Flyers led to a hotline number, then a recorded message, then a secret meeting spot, where you’d get a map to a far-flung barn or campsite. The stealth gave the movement a thrilling quality. But as the media hyped the dangers — designer drugs and fire hazards — musical trends changed, sending EDM deep into the underground. Twenty years later, you can still attend a “rave” in Wisconsin, but it will be easy to find. A promoter will tweet about it, and it will take place at a public venue like the Alliant Energy Center, where on April 13, the electronic artist Bassnectar will crank out party bangers and inventive remixes of tunes by dance-pop darling Ellie Goulding and gypsy punks Gogol Bordello. Many of the genre’s visual elements are the same as they were in the 1990s, but they’re bigger and brighter, with laser lights, fog and projected images that make mouths gape as thousands of bodies writhe to the rhythms of dubstep, electro house and other varieties of EDM. If you go to the Bassnectar show, look for a crowd writhing ecstatically in a stew of bleeps and bloops, waving their hands amid a miasma of confetti. EDM’s popularity is booming. After performing mash-ups at UW-Madison’s student union five years ago, Girl Talk now fills the Alliant Energy Center’s 6,000-capacity Exhibition Hall. Bassnectar will likely do the same. He played the tiny King Club in 2007 and the Majestic Theatre in 2009. Some fans who’ve experienced both rave scenes swear they’re similar. Matt Fanale, a local music fan who DJs under the name Eurotic, says a new generation of concertgoers wants to dress in neon and dance till dawn. To him, this is evidence that music trends come in 20-year cycles, and that the motivation to party is the same as it ever was. Fanale suspects that the sluggish economy has fueled attendance at live electronic shows. “With the world as depressing as it has been lately, people want to lose themselves with thousands of others. It’s more fun to be happy than angry,” he says. The paradoxically isolating nature of social media also plays a role, according to DJ Nick Nice, who helped launch the Midwest rave scene in the early 1990s after spinning records at Queen, a Paris club where David Guetta curated the music. “Facebook is such a solitary experience. It’s basic human nature to want to be social, and listening to music with thousands of other people reminds you that you’re not alone, even when the world seems to be falling apart,” he says. Though these concerts can draw huge crowds and kindle a sense of connection, they can also create rifts. Madison resident Vinnie Toma loves to DJ. He’s built a career around it since 1998. But when he thinks about nuevo-raves, his heart sinks. Though many who attend these shows crave connection, this quest, for some, spirals into escapism. Local DJ Wyatt Agard says these big shows sometimes don’t feel like raves at all. In the early days, raves revolved around ideals like unity and respect. Partygoers hoped to find themselves as they swam through rooms of trance, house and techno — or at least that’s how they remember it. Despite EDM’s popularity, it didn’t gain much mainstream acceptance in the 1990s. Its sounds filtered into the public consciousness from underground. Nowadays, though, its key elements — synths, samples, sequencers — drive songs by Top 40 artists like Lady Gaga, Rihanna and Ke$ha, as Jay-Z raps atop Daft Punk tracks. Daft Punk’s influence can’t be understated. The French duo, whose songs include “One More Time” and “Harder, Better, Faster, Stronger,” have transformed disco beats into music that sounds thoroughly modern, and their music can be found in the soundtrack to Tron: Legacy, videogames like Just Dance 3 and nearly every corner of the web. The group played one of their first live performances at a Wisconsin rave in 1994, notes Chris Vrakas, a Milwaukee-based DJ and event coordinator for Chicago-based concert promoter React Presents. Daft Punk also proved that live EDM could be more than a DJ spinning records or tickling a computer keyboard. The group donned space-ready helmets on their 1997 tour, which spurred other EDM artists to bust out the theatrics. 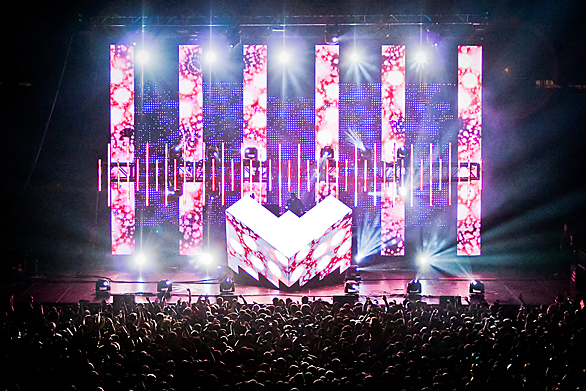 Glitch-hop act Pretty Lights crafts visual spectacles incorporating colorful lights and 3-D images, and Deadmau5 has designed his own whimsical headgear with the help of Jim Henson’s Creature Shop. Ryan Parks, a local EDM fan who hosts WORT’s “Something Wonderful” on Monday Nights, says Deadmau5’s live show is particularly buzzworthy. These abstract effects attract various kinds of fans, from music-loving Gen X-ers like Parks to kids barely old enough to drive. The under-30 set tends to dominate, though. According to UW-Madison seniors Azaria Posik and TJ Matzen, who book, blog and promote for Wisconsin Union Directorate’s music committee, EDM’s popularity among college students relates to the scene’s inclusiveness. There’s no need to memorize lyrics or wow others with band trivia, which makes it easy to invite large groups of friends to the show. DJ and promoter Agard says live EDM’s popularity stems from booking decisions clubs made to weather the recession. “The downfall of the economy made it expensive to book bands, so clubs started booking more DJs because DJs have a higher draw per dollar spent,” he says. Take Majestic Theatre co-owner Matt Gerding. Despite being a rock enthusiast, he couldn’t help but notice that Deadmau5 and Bassnectar were climbing the ranks at Lollapalooza. Now Gerding books many of the area’s big EDM shows, including 18-and-up performances at the Orpheum and the Alliant. Riding the EDM wave has been exciting, he says, because it’s uncharted territory for the Majestic team. Booking the shows has meant making some potentially costly decisions about bumping acts like Deadmau5 and Bassnectar to the Alliant. “Moving a show to a larger venue, that’s a decision made mostly by the artist’s agent, manager or record label, when tickets are moving at a speedy clip,” he says. The risk has paid off, and several EDM artists now visit Madison twice a year rather than once. This is good news for venue owners, but it can mean slow nights for local performers who draw some of the same crowd.